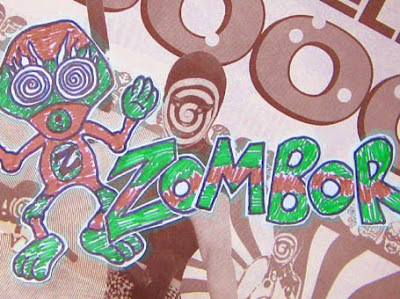 KawaiiPunk - Kawaii Mascot Blog: The Fearsome Zombor! It’s a drawing of you as a fearsome wrestler, as I think you would make a very fitting opponent for the Wrestler Mascot. I know, it is a work of genius, isn’t it? I thought you could call yourself Zombor, as it sounds quite fearsome, and have given you a suitably fearsome mask to match the name! What do you think? Reckon you could take on the Wrestler Mascot for me?